Using an animated explainer video as a tool for training employees seems to not be that new. Firms from all over the world use this video content format for their employees to get closer to its corporate culture, to obtain new skills and to stay informed about the latest trends. Huge companies such as Intel or IBM apply whole programs in video format, instead of those classic face-to-face seminars. With this system, they encourage e-learning, but why? The main reasons are that video is more affordable, it can be tailored to the employees’ rhythm, and it is much more efficient. So, why were many companies until now resisting using this video format, in training their staff? Why worry about including this strategy, which gives so many benefits to companies of every size, all around the globe? If you are reading these lines, it could be because you do not use this technique yet, and you are thinking about the necessity of applying it, or perhaps because you are making use of it already, and you would like to improve its efficiency. There are many research studies that support the memory effectiveness of visualizing the message, rather than just hearing it. For instance, we can retain just 10% of the information we hear, but in watching it, this percentage rises to 50%. That is why an animated explainer video, in combining audio with images improves the ability to retain the sent message significantly. Let’s suppose that you should organize some training sessions any time you hire a new employee, or there is important news to be shared. Obviously this impacts the budget, and is a time-consuming endeavor for planning trips and organizing the HR agenda. With corporate videos, these problems are solved, as long as there is no need for employees to stand together in the same place, or a need of providing an expert who might translate the information to the staff. One of the best advantages of the explainer video is, of course, that you can use it 24 hours a day, 365 days a year. That way, employees can enjoy this availability to access the explainer video content, inside or outside the workplace. According to the fast extension of technology, there is no need for a special device to access to the company’s training contents. Anyone can watch it from their Smartphone (mobile friendly). Every new employee is a brilliant idea that needs to be polished. Although she or he can be bright, it is also true that the corporate culture is new for her or him, and needs to adapt its manners to the company’s style, processes and values. 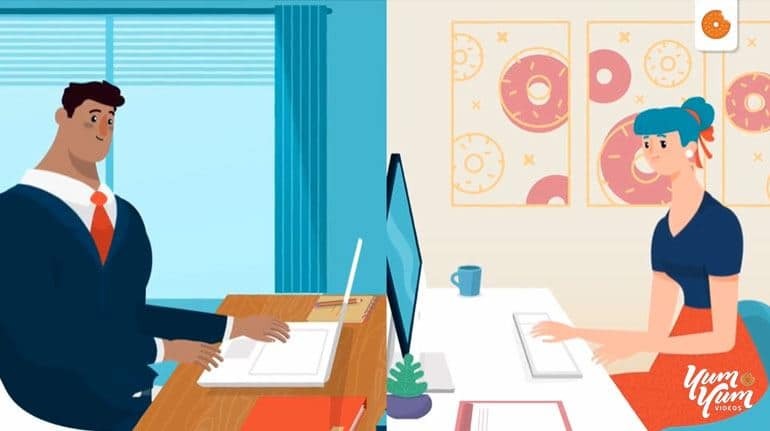 In this sense, the animated explainer video can play a double role: show the new employees how the company is organized, and translate the meaning of their hiring desires. In offering a quality service to customers, a deep employees’ knowledge of products and services becomes crucial. This is much more important in case you offer a technical support or online service. Training your staff is the only way to guarantee that knowledge, keeping the high turnover rate into consideration. Is it possible to improve the learning curve and the deepness of the knowledge arranged by your employees, by using explainer videos? It is definitely possible. By using an animated company video, we can either show demos of the best use of a product, a practice impossible to realize in a face-to-face presentation. Idea #3: Training the staff who work in front of customers. In many companies, quality customer service implies the difference between sell or not doing it at all. In the commercial sphere, this employee’s segment is called the front-line staff. Now, let’s suppose that you should offer this training in three different places simultaneously, does it not make more sense to use a series of explainer videos? Trips, training costs and a huge amount of coordination time can be avoided, because those company videos can be accessed by any employee anytime and from anywhere. Have you ever heard about “organizational silos”? In large sized companies, with complicated production processes or many divisions among departments, quite often the “organizational silo” phenomenon appears. With this organizational layout, the information remains isolated in niches, employees skip perspectives in their jobs, and they can feel discouraged or disconnected from the rest of the company. 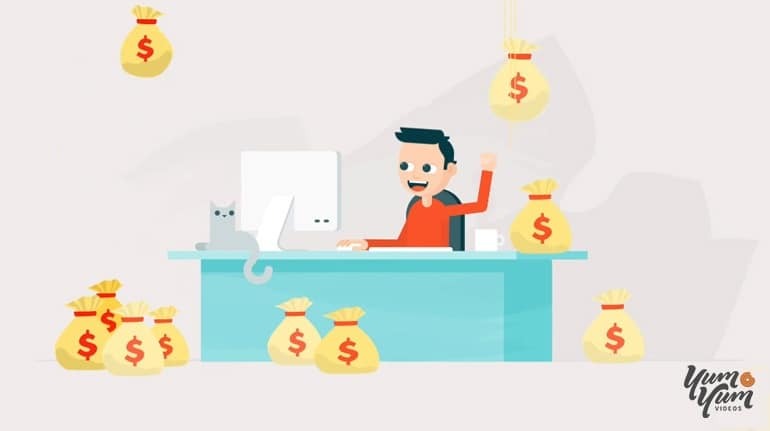 The animated video for business can be used as a power tool in solving these problems, as long as it provides the necessary information to any employee, in order to be updated about the other departments’ functions, and their role in it. A change in your strategy, a new entrepreneurial focus or the long-awaited moment to be listed in the stock market, those are some examples of revolutions in a company. But going forward, they also can seriously affect the performance of employees if they do not communicate properly. Internal notes are fine, but let’s be honest, no one reads them. And precisely at this point, an animated marketing video can make the difference. No one will resist watching it, they have the ability to attract the viewer’s attention very quickly, and know how to obtain a good assimilation in a quick and efficient way. The efficiency of a work team can always be improved upon. Precisely with this trend, every year companies spend millions of dollars in increasing the efficiency of processes, and designing new technological tools. How much time is needed for a 1,000 person team to assimilate this process? How much money, and how much time can the organization lose, while this work team acquires and internalizes new process? The explainer video allows you to shorten those periods. If the video is well built, it will be a fast tool in communicating the new process, or the technological tools’ specifications that you are launching. There are departments that need more training than others. For instance, in the sales department, training is an important asset because of the high turnover of commercial profiles. According to the advantages of sales videos, this mission becomes much easier. You will be able to train your work team about the best commercial practices, as well as your product and services, in a deep approach. Is your company an international enterprise? You can also benefit from the development of those training-directed videos for remote work teams. If your employees are spread all around the globe, you can line up processes and methodologies, and be sure that the knowledge will soak through to your employees. Specially if there is a global culture for your employees to follow, and there is a necessity to acculturate it to different countries at the same time, you can use the best explainer videos for sharing the values that make your company stronger. As you have seen, all the possible audiences, the corporate ones, and others, can benefit from this content format. It is easy, visual and it can transmit better than any other system the message that you are trying to translate. 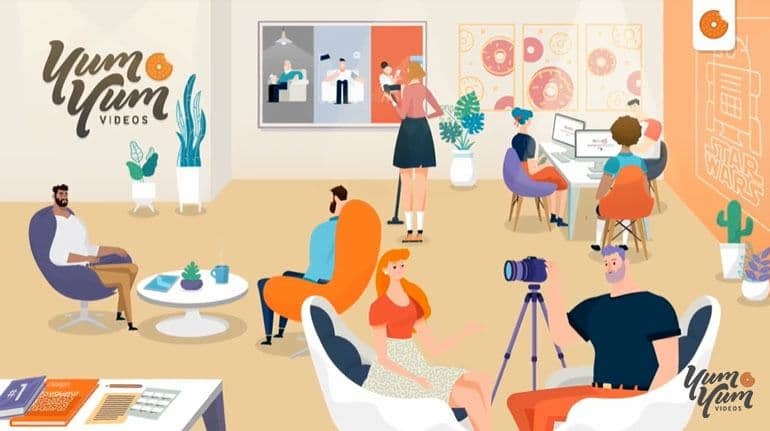 If you don’t know exactly which explainer video company can help you with selecting the best video, take a look to these tips, they will be helpful for sure. Don’t forget to visit the Academy for video marketing resources of Yum Yum Videos: you will find information on ebooks, infographics, and, of course, many videos to better understand which explainer video suit your needs best, but also marketing tips for promoting your video once it is ready. I will keep waiting for your comments or ideas about the best way to train work teams by using training videos. Looking forward to hearing from you! Carmen Díaz is a Content Marketing Manager at Social Media Pymes. She works in designing and implementing content strategies for those companies eager to get to know their brand with a content focus, aware of user’s´ interest in information, rather than in publicity.